A black tie wedding at a modern art museum. Neutral gray letterpress and white on white foil stamping is elevated by a pop of color with a wrap of fluffy yarn from Purl Soho. The save the dates, screen printed on mandarin colored paper, is a flip on the standard photo save the date card. With a posterized effect the couple towers over their venue, (fun fact: they were holding drinks in their hands in the actual photograph. 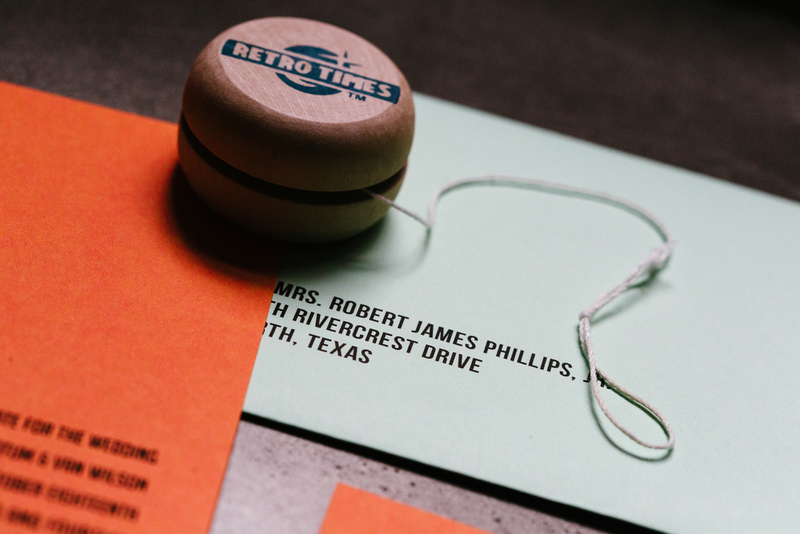 A larger than usual "M" on the reply card matches the large block letters on the main card. Another pop of color is delivered with deep purple travel card screen printed in gray. Cocktail and dinner napkins were printed with the couples names.